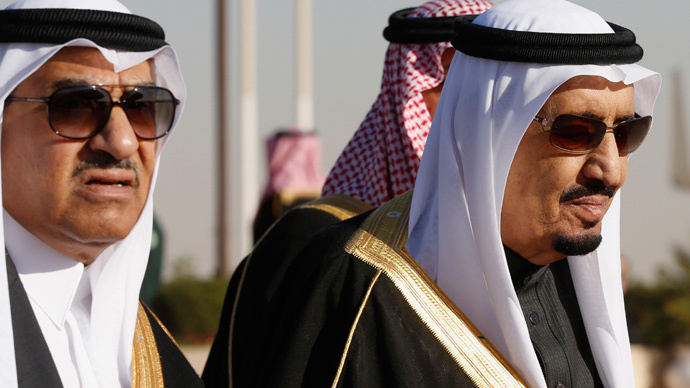 In a move that is likely to solidify ties with the US for decades to come, King Salman of Saudi Arabia has undertaken a major reshuffle, appointing Mohammed bin Nayef as his new successor and his son Mohammed bin Salman as second in line to the throne. The decision by King Salman, who succeeded his late brother King Abdullah, who died on January 23, replaces his half-brother Prince Muqrin with Mohammed bin Nayef as crown prince and heir to the Saudi throne. Mohammed bin Salman, who is 34 years-old, is King Salman’s son. In his position as defense minister, the new deputy crown prince has been overseeing the Saudi-led coalition’s bombing campaign against anti-government Houthi forces in Yemen. Both princes are part of a generation of grandsons of Saudi Arabia’s founder, the late King Abdulaziz al-Saud, whose sons have passed power from brother to brother since his death in 1953. The majority of the family’s Allegiance Council approved both appointments. The selections are seen as a shift away from the princes who had been favored by King Salman’s predecessor, King Abdullah. The 55 year-old Mohammed Bin Nayef is seen as a close friend of the US and has been effective in the country’s fight against Islamic militants. The crown prince speaks excellent English and studied in Portland Oregon in the US during the 1980’s. Mohammed Bin Nayef is “well liked” in US circles, having served as Saudi Arabia’s counterterrorism chief and later as interior minister. Meanwhile, a senior official in the Obama administration added, “What he has — and which American officials have grown to appreciate in particular — is that he’s quite pragmatic and not particularly ideological,” the Washington Post reported. The crown prince has been widely praised in all circles for his tough stance on terrorism, something he has experience of first hand. In 2009, Al-Qaeda sent an assassin to try and kill Mohammed bin Nayef. The suicide bomber, disguised as a defector, approached the man before setting off a bomb concealed in his clothes. The first in line to the Saudi throne survived the attack unscathed. Mohammed bin Nayef’s stance on Yemen has been equally strong, with the crown prince being a staunch supporter of Yemeni President Abd-Rabbu Mansour Hadi, who is currently in exile in Saudi Arabia. This viewpoint is shared by the deputy crown prince, Mohammed bin Salman, who has taken a hands on role in the Yemeni conflict, overseeing the bombing raids against the Houthi rebels. The airstrikes, currently in their fifth week, have seen parts of the country devastated. The UN agency for children, UNICEF, reported that at least 115 children have been killed, though the death toll could be higher, while at least 30 schools and 23 hospitals have been damaged during the conflict. On Wednesday, King Salman ordered all military and security personnel to be given a one-month salary bonus on Wednesday to convey his “appreciation of their efforts,” in what is most likely a reward for the current campaign in Yemen. Royal bonuses are common in Saudi Arabia during times of political change. In January, King Salman ordered payment of two months extra salary and pensions to government employees and retirees. In his position as the head of the country’s defense, the deputy crown prince is also responsible for huge arms purchases from the US. The UK also sells billions of dollars’ worth of weapons and planes to Saudi Arabia, some of which have been used the ongoing campaign in Yemen. Mohammed bin Salman is by far the youngest Saudi in a senior decision making role. With 60 percent of the Kingdom’s population under the age of 21, King Salman’s son has been keen to portray himself in the Saudi media, which is owned by his father, as the leader of a new younger generation of Saudi’s. Human rights groups are unlikely to welcome the news of King Salman’s appointments, citing Mohammed bin Nayef’s past track record in dealing with government opponents. “What’s very troubling about his record is that he is the principle architect of this massive onslaught against dissidents and human rights activists,” said Adam Coogle, a Saudi-based Middle East researcher for Human Rights Watch. “He is the chief, number one hard-liner, and he is persecuting moderate, independent voices for reform,” the Washington Post reported. Coogle mentions that Mohammed bin Nayef’s policies are more extreme than his father’s, Nayef bin Abdul Aziz, who was crown prince when he died in 2012. While his father would lock up opponents for a few days to teach them a lesson, Mohammed bin Nayef has taken a much tougher line. He has implemented a system with actual trials and charges for citizens who criticize the regime, with jail sentences of 10 to 15 years common. Human Rights Watch has been routinely critical of Saudi Arabia’s record on the treatment of political opponents and the country’s inability to protect the rights of around nine million foreign workers in the region. In May 2014, a Jeddah court convicted activist Raif Badawi and sentenced him to 10 years in prison and 1,000 lashes for “insulting Islam” by founding a critical liberal website and for his comments during television interviews. This move brought condemnation from governments across the globe. However, a number of Western countries who have voiced criticism are still happy to back the Saudi regime and supply it with weapons in exchange for the billion dollar contracts they receive.